The word biscotti in Italian roughly means "twice baked." The key to making biscotti is to bake the cookies in a loaf, then slice the loaf and reheat the slices. 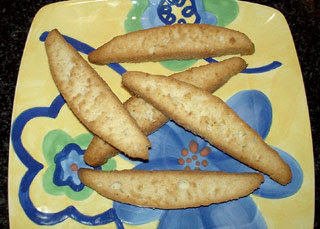 Biscotti are traditionally a dunking cookie. In various parts of Italy they are served with wine for this purpose. There are hundreds of recipes for biscotti. The one I use has been in our family for generations. It was passed on to me from my father's sister; Aunt Rosie. Aunt Rosie's Biscotti Ingredients 1/2 cup butter 1/2 cup shortening 1 cup sugar 6 eggs 3 cups flour 1 tsp baking powder 1 tsp vanilla 1 tsp anise extract Preparation Preheat oven to 350 Beat together butter and shortening. Add sugar beat until well blended. Add eggs 1 at a time. Mix in vanilla and anise. Add flour and baking powder slowly; mixing well after each addition. Batter will be stiff. Form batter into 3 inch wide slabs on ungreased cookie sheet. (should make 4 slabs). Bake for 20 minutes or until golden brown. Cut into 1 inch bars and return to oven for 10 minutes flipping half way. I've been making them for so long I can pretty much do it in my sleep. One thing I have learned since coming to Phoenix is to adjust the flour a little. It's so dry here that sometimes you don't need as much. Don't give up..they're so worth it!